Base price: Official pricing not yet available; $45,000 est. Price as tested: $47,000 est. The EPA rates the Niro EV’s range at 239 miles. After a Level 1 (normal 110-volt household outlet) recharge in my garage, I saw a range estimate on the Niro’s computer of 250 miles – and this was in cold weather. While “your mileage may vary,” that’s still a useful amount of driving range, something that didn’t deter me from taking many trips I wouldn’t have ventured in earlier, shorter-range electric vehicles. 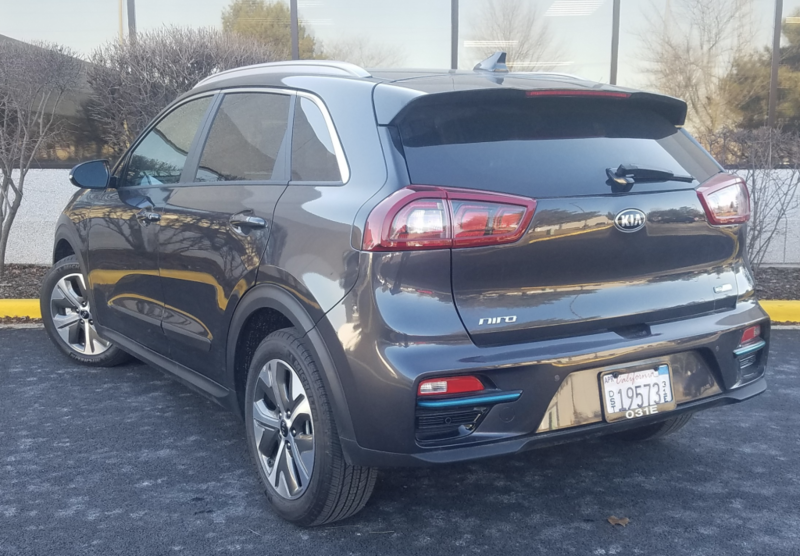 With an EPA range estimate of 239 miles — something our test confirmed to be realistic, even in colder weather — the Kia Niro EV offers a useful driving distance between “fill ups.” This is at least double (and nearly triple) what earlier electric vehicles offered, and really helps make the Niro EV a practical car for everyday commuting. While low per-mile cost and zero emissions are the biggest advantages touted for electric vehicles, I think that really short-changes them in a couple of key areas. One was demonstrated during the aforementioned cold weather: that of being able to pre-heat (or pre-cool) the interior before getting into the car, even if it’s parked in a closed garage – something you don’t want to do with a gas car. And even if you don’t take advantage of the offered “pre-conditioning,” the heat comes on much faster than it does in a typical gas vehicle. Also, there’s very little in the way of maintenance to do on an electric. Not only does that same time and expense, it saves an awful lot of trouble as well. Two pulls on the steering-wheel flipper (arrow) will give you Level 3 regen (the strongest), which will decelerate the vehicle when you lift off the throttle, probably more than you would normally want — so you learn to modulate with the gas pedal. It essentially allows for one-pedal driving down to about eight mph. More often promoted are an electrics’ driving characteristics. As with most current long-range electric vehicles, nailing the Niro EV’s throttle from a stop generates a decent jump off the line, but the real marvel is the instant throttle response when you hit the “gas” at speed. Also, you can adjust the amount of “regen” (how strongly the car decelerates when you lift your foot off the gas as it recharges the battery) to one of three levels, the strongest allowing you to drive in normal traffic without hitting the brake pedal until you get down to about eight mph — a real convenience. Add to that a great ride/handling combination (thanks in part to having the heavy battery mounted low in the vehicle for a lower center of gravity), and it’s tough to beat an electric in the “fun-to-drive” category. Here’s some cleverness: The covered cupholder bin not only includes two cupholders with handy corner pockets, but the cup restraining arms can be retracted to provide even more space. As with range, cost is also becoming competitive with gas vehicles’ – at least if you factor in the current $7500 federal tax credit. Kia hasn’t yet released official pricing for the Niro EV, so we don’t know the selling price of our early production test vehicle — but since it’s a loaded, top-line EX Premium, we suspect it would bottom-line at about $45,000. Back out the $7500 tax credit, and that comes to a pretty reasonable $37,500. Furthermore, the base EX is probably a few thousand dollars less, but you’ll give up such niceties as the power sunroof, leather upholstery, 10-way power driver seat with power lumbar support, heated and ventilated front seats, Harman Kardon sound system, navigation system, rear obstacle detection, and Qi wireless phone charger found on our tester. While that’s the current state of the art for the Kia Niro EV and most other electrics, this, too, is getting better. Currently under development are chargers that can transfer that same amount of power in about ten minutes or less, and at that point … you’re there; stumbling blocks to electrics are about gone. But what do you get if you buy a Kia Niro EV today? 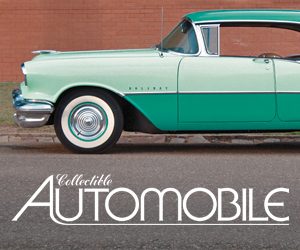 Well … a darn nice vehicle, as it turns out. Get in, and you’ll find the Niro offers good headroom and very good legroom in front. In back, 6-footers should find decent headroom, though legroom and foot space gets tight if the seat ahead is moved all the way back and down. Also, egress can be a bit awkward for larger folks, but a nearly flat floor means smaller ones can sit three across without the center-seater feeling as though they’ve been put in the penalty box. Visibility is decent all around – and especially good to the sides, where it often isn’t – and our tester had a rearview camera that offered a fairly wide view (though not quite 180 degrees) and showed a particularly bright image at night. It’s not fancy, but the Niro EV’s business-like cabin is nicely trimmed and well laid out. The console gear selector is a rotary knob surrounded by a few buttons, one of which activates the Brake Hold function that will hold on the brakes at long stops so you can release the pedal. (Otherwise, releasing the brake will allow the Niro EV to creep forward, just as in a gas car with automatic transmission.) Ahead of the console are two handy, sizable storage compartments. Some electrics save weight and cost by “cheaping out” on interior materials, but the Niro isn’t one of them. Major touch surfaces are padded, and the overall look is very nice. Cabin storage is quite impressive, consisting of a decent-size glovebox, fair-sized console box with 12-volt plug, two cupholders with small surrounding bins, a large forward console bin under 12-volt and dual USB plugs, a “flat” dash bin with Qi wireless charging in its floor for a cell phone, and small map pockets with cupholders in the doors. Infotainment control include volume and tuning knobs along with eight buttons, and while all are mounted high, those to the right are just a bit of a stretch. Same goes for the climate controls, which have rotary knobs for temperature and fan speed, a less-convenient repetitive-step pushbutton for mode. Due largely to a low ceiling height, the Niro EV’s cargo compartment is a bit on the small side for a compact crossover, and the one-inch step to the folded rear seat backs is another minor demerit. But there’s a lot of added storage space under the cargo floor, and it includes a handy slot to hold the cargo cover — a nice touch. Although cargo-area space – and especially, cargo-area height – might be on the small side for what we, at least, consider a crossover, versatility is quite good. There’s a large amount of under-floor storage, including a slot to hold the cargo cover (nice! ), with the only demerit being that the folded rear seat backs rest about an inch above the level of the cargo floor – and in our tester, that the high-end stereo includes a speaker that takes up a side-wall well that otherwise allows for a good amount of cargo width at the rear. While it’s likely that electric vehicles will continue to get better, the Niro EV is good enough to justify making the jump to plug-in power right now. 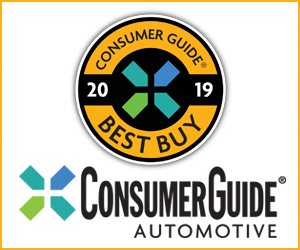 (So are some of its closest competitors, which include the Chevrolet Bolt, Hyundai Ioniq Electric, Hyundai Kona Electric, its upcoming sibling Kia Soul Electric, Nissan Leaf, and the Tesla Model 3.) For one thing, the $7500 tax credit may be going away (and diminishes anyway after a manufacturer sells 200,000 units, which some have reached or are approaching), and the Niro EV, at least, demonstrates that pure-electric vehicles have advanced to a point where they’re already strong rivals to gas vehicles, while offering many advantages their petrol-powered compadres cannot. Note that for the 2019 model year, the Niro EV will only be retailed in the following states: California, Oregon, New York, New Jersey, Maryland, Massachusetts, Connecticut, Vermont, Rhode Island, Washington, Hawaii, Georgia, and Texas. 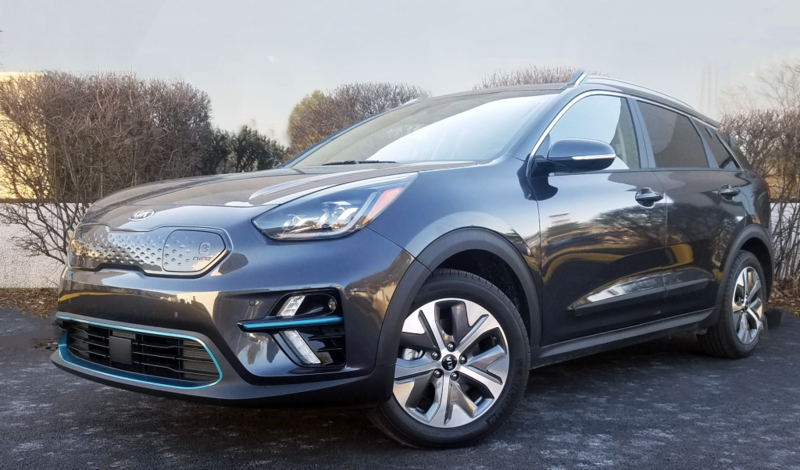 With its low silhouette and front-drive-only platform, the Kia Niro — whether in hybrid, plug-in hybrid, or pure-electric configuration — sits in a gap between compact cars and traditional compact crossovers. But call it what you will, our electric tester came off as an impressive vehicle that truly challenges gas ones for practicality. Written by: The Daily Drive staff on April 8, 2019.on April 9, 2019.